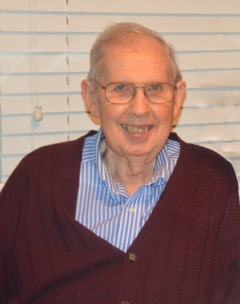 We are deeply saddened to announce that our beloved husband, father, grandfather and friend, Thomas (Tom) Harshman Smith from Springfield, VA passed away on Sunday, September 9, 2018 at age 91. He passed peacefully with family and friends near and far holding him in their thoughts and prayers. Tom was a WWII Army vet, having spent time overseas as the war was ending. He gained his interest in electrical engineering through radio and electronics from his experience. Tom, born June 1, 1927, came from a humble farming family in Hagerstown, MD. His mother Edna M. was a homemaker and father Earl M. Smith worked for the Blueridge Transportation company. Young Tom soon began work as a mechanic at the same bus company. The story goes — a large glob of grease hit him in the eye and he knew then it was time for a career change. He worked and studied hard at DeVry Technical school in Chicago, IL to earn his associates degree. He fined tuned his craft and held several positions at Melpar and Bendix before spending many years of his career in the Math Lab of the Naval Surface Warfare Center - Carderock Division, formerly David Taylor Research Center, until he retired. Through the years he enjoyed gardening, learning about new technology and sharing that knowledge, political discussions, fishing, home construction projects and watching professional sports teams, such as the Washington Nationals baseball team. Our hearts are heavy; however, we will remember all the good times, excellent advice, and great stories he shared with us. We will always keep him alive in our memories. He is survived by his wife of 65 years, Maurita Palmer Smith; son, Mike Smith; daughter, Shelley Haley; son-in-law, Todd Haley; 2 grandsons, Jamieson and Cooper Haley; 2 brothers, Donald and Nevin Smith; nieces and nephews; and predeceased by his brother Arthur Smith. Gone but never forgotten. We love you and we will make you proud! Services will be held on Thursday, September 13, 2018. Visitation at J.L. Davis Funeral Home, Smithsburg, MD, at 12:00 pm with service to follow at 1:00 pm by Rev. Doris Haley. Burial will be in Mt. Zion United Methodist Church Cemetery of Myersville, MD. Donations may be made to the Fisher House Foundation, 12300 Twinbrook Parkway, Suite 410, Rockville, MD 20852. Online condolences may be offered at, www.jldavisfh.com.